Predictive Dial Algorithm Boosts Debt Collection | 8x8, Inc.
Making phone calls is one of the most fundamental parts of the debt collection process. Unfortunately, it is also one of the most time-consuming and least productive tasks a debt collector does. A collector may spend a significant part of their day making calls, with many calls going unanswered, and many calls that do get answered being hung up quickly. For every minute a collector spends trying to make calls, they are wasting time they could be spending on talking to debtors and making payment arrangements. Fortunately, there’s a way to save time by automating the dialing process. A predictive dialer algorithm can significantly reduce the time debt collectors spend per call, allowing them to make more calls per hour and collect more debts. Here’s how predictive dialer technology makes the debt collection process easier and more efficient. Automatic dialing: A predictive dialer system can store a large database of calls and place calls automatically while human agents are performing other tasks. The software’s predictive analytics tools automatically adjust the rate of outbound calls based on variables such as the number of human agents available, the percent of calls that get answered, the average number of rings it takes a call recipient to pick up, the average amount of time an agent spends per call, and the target abandonment rate (the percentage of call recipients who hang up before the system switches the call to an available representative). Typically, the number of outbound calls at a given time is about double the number of available agents. This ensures that available agents stay busy, while also ensuring the number of calls does not exceed the capacity of available agents, as well as reducing wait time and abandonment rates. Automatic call screening: Predictive dialer systems streamline call volume by identifying calls that fail to get answered and automatically hanging them up. This avoids wasting time with numbers that fail to pick up. Automatic call queuing: When a caller picks up, predictive dialer algorithms identify which agents are available and queue calls in the order received. If the algorithm determines that an agent will not be available immediately, a recorded message can be played to keep the call recipient occupied. By performing these functions, predictive dialing systems maximize outbound call volume, while minimizing wasted time for call representatives and call recipients. How Can Predictive Dialer Algorithms Benefit Debt Collectors? Using a predictive dialer algorithm can benefit debt collectors by allowing them to contact more debtors while wasting less time on call recipients who hang up. Callers who dial only one number at a time typically only spend 40 minutes an hour doing actual debt collection, with the rest spent on making calls or getting hung up on, according to predictive dialing inventor Douglas A. Samuelson. This translates into 33 percent of time wasted rather than doing actual debt collection. Switching to a predictive dialer system can significantly improve this productivity ratio. Employing a predictive algorithm can increase the amount of time spent on actual conversations up to 57 minutes an hour, with only 5 percent of time wasted instead of 33 percent. This represents a productivity gain of over one-quarter of total time per hour. Multiplying this by the amount of debt collected per successful call can give you an idea of the value of a predictive dialer system. Taking advantage of today’s predictive dialer technology requires using the right platform. The best way to make the transition is to adopt a cloud contact center platform that has predictive dialer technology built in. In addition to predictive dialing capability, a suitable platform will need to have superior call center features, particularly strong security features if you will be discussing sensitive financial information over the phone. 8x8 cloud call center software fits the bill on all counts. The 8x8 platform offers predictive dialer capability that maximizes talk time as part of a comprehensive array of call center features, including a web-based user interface, visual IVR, and real-time analytics. 8x8 contact center services are backed by enterprise-quality security that meets rigorous PCI standards, ensuring your call recipients’ financial data stays safe. If you’re looking for a way to get more productivity out of your debt collection team, a predictive dialer algorithm may be just what you need. 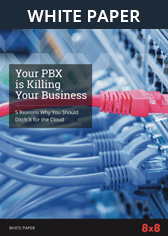 If you’re considering a predictive dialer solution, you’ll want to be sure to check into the 8x8 suite of cloud communication services. Your cloud provider and available features set directly affects your collection business' bottom line. Choose a superior cloud system and ensure that this effect is for the better. Fill out our online form today or call us at 1-866-879-8647 to request a no-obligation quote from an 8x8 Product Specialist.